Cote Village: A rendering of a new residential building that will rise on Cummins Highway next year. The Mattapan community is one of the outlying Boston neighborhoods that has not yet been acutely impacted by Boston’s building boom. Data made public this week by the city’s Department of Neighborhood Development (DND) show that the neighborhood has accounted for a small slice of the city’s new housing starts since 2014 – with a growth rate of three percent compared to the citywide average of 6.6 percent. That is almost certain to change over the next few years. A proposal to build 76 new units of housing on what is now an abandoned car dealership on Cummins Highway and Regis Road has won the necessary approvals to move forward. It’s a transit-oriented development that has been spurred by the state’s investment in what will soon be a new MBTA commuter rail station situated behind Woodhaven Street. 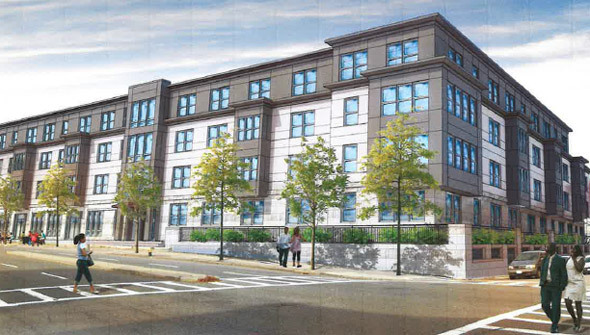 Meanwhile, the MBTA has approved a plan to allow a development team to build affordable housing – as many as 135 units – on what is now an underused parking lot next to the trolley and bus depot at River Street. Meetings to engage the community on design plans have been ongoing and the project—led by Nuestra CDC and Preservation of Affordable Housing (POAH) – is taking appropriate steps to keep Mattapan stakeholders in the loop. Next week, a proposal to build a smaller apartment complex at 73 River Street – four stories, 18 units – will be vetted in a BRA-led meeting set for Sept. 22 at 6 p.m. at 249 River St. These are all welcome developments – as long as the builders adhere to community standards, seek to meet thresholds for diverse employment, and strive to make sure there are ample affordable units built in. The city’s Article 80 large development process, via the BRA, will be the proper mechanism to make sure they do. But longtime Mattapan civic activists are not just waiting for developers to find them and fire off proposals in a vacuum. The contents of the report have not yet been made available, but an executive summary provided to the Reporter this week indicates that it will include detailed demographics of the neighborhood and “a parcel analysis” of Mattapan. “It endeavors to provide a level of objective detail that will strengthen the community planning and policy development and citizen engagement,” reads the summary. Mattapan is a community that needs more long-range planning than is currently happening. The city’s chief agency for planning – the BRA – is thoroughly engaged in targeted planning initiatives in South Boston and Jamaica Plain. Dorchester’s Morrissey Boulevard corridor and Glover’s Corner are likely next. Mattapan United and its partners at BC are to be commended for not waiting for data analysis and engagement to come to us. The Mattapan community has strong stakeholder organizations already in place— Mattapan Community Health Center, the Mattapan Food and Fitness Coalition, Colorado Street Civic Association, and Mattapan United— that can help guide a civic dialogue that is constructive and forward-thinking and engage like-minded developers like Nuestra-POAH, who have, so far, provided a model for how to plan for a long overdue development cycle that will lift all boats in Mattapan Square. Well-organized and respected community advocates have already made great strides in re-connecting Mattapan to the Neponset River through a much-anticipated Greenway extension that will open in the coming weeks. The square itself is undergoing a welcome beautification project this month. More building projects are no doubt on the horizon. This new report is a welcome tool to help residents and existing stakeholders exercise some local control over how the coming years will unfold.